A bridge is a way to connect two impossible points together. It is a path forward where before there was only an impassable horizon. Heinrich “Henry” Springer is a man who knows bridges. He helped in the engineering and construction of more than 22 bridges in Alaska, including the iconic 1971 Hurricane Gulch Bridge and the bridge over Nenana Canyon, two technically challenging bridges on Alaska’s Parks Highway. Springer is himself a type of bridge. 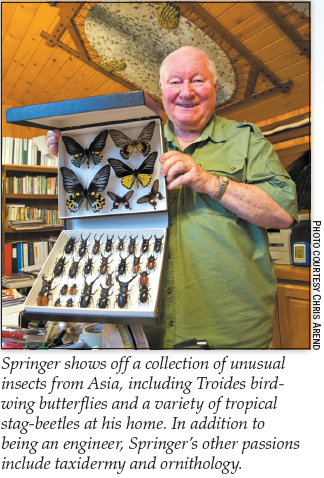 An artist, engineer, ornitholo­gist, hunter, taxidermist, scientist and a one-stint state legislator, Springer has spent his career building bridges between each of his life’s passions and finding ways to support and connect each of them together. Springer was born in 1936 in Lindau, Germany, and grew up in the southern German factory town of Donauwörth, where WWII military equipment was manufactured. His father was a soldier who spent most of his wartime on the Russian front. As a child, Springer spent much of his time outdoors, seeking refuge in nature. This was the start of his love of birds. It was a passion that has carried him throughout his life. “My life consisted of birds,” Springer said. But having raised him in the tough years during and after the war, Springer’s parents desired a better life for him. His family wasn’t wealthy or connected, so his parents encour­aged him to go into engineering. “Ornithology doesn’t pay much,” he said. During his last year of college, he made the calculated decision to apply for a United States visa because of demand for civil engineers in the late 1950s. In 1959 he finished school and left for New York. Having previ­ously spent a year in Pennsylvania milking Guernsey cows on a family farm as part of a Fulbright High School Exchange Program, Springer was prepared and eager for all that America had to offer him. His memo­ries of the war, and the prospect of living in an overcrowded, already-developed country, spurred Springer to move on from Germany. He didn’t even let the draft stop him. As a stipulation of getting an American visa in 1959, all eligible male immigrants were conscripted for the draft. He had 48 hours to report to the draft office after he arrived, which he did. A planner and researcher at heart, Springer did his homework and enlisted in the U.S. Army Corps of Engineers. He had hoped to get stationed in Europe, but that wasn’t an option. Eventually he settled on Alaska because, primarily, he was interested in the bird populations here. While serving his full three years with the 18th Engineer Company at Fort Wainwright, he also pursued his passion of studying birds. His work as a civil engineer in the Corps exposed him to working with the newly formed State of Alaska. It was the perfect launching point for his career. The Alaska Department of Highways, now the Department of Transportation & Public Facilities (DOT&PF), hired him within two months of leaving the Corps. He quickly gained recognition for his work on the bridge projects he managed in Nenana Canyon and Hurricane Gulch. This fast-tracked him to a position as a transportation director for Alaska DOT’s Western Region, based in Nome. He would call Nome home for 15 years. Three of those years he served in the Alaska House of Representatives after beating five opponents in a race into which he sunk all of his energy. Springer said. He believed he brought valuable experience and knowledge to his work on the Community and Regional Affairs Committee, but he didn’t want to continue. After one term, he wanted to go back to engineering. organization on collaboration and planning. This created a path for there to be collective priorities through the legislative committee, as well as prioritization of new educational programs to support the construction industry. Over the years, bridge construction became Springer’s specialty, though he worked on plenty of road projects. He reflected that it was much easier to be an engineer in those days. 10-year plans with secured funding to being split into phases, with each phase needing funding. “Long-term stability is essential for supporting this industry,” Springer said. Certainty leads to growth. With the phasing process, this stability went away and was relegated to the whims of the push and pull of special interest groups. It became part of the political process. All of this has led to a large backlog of work and what Springer sees as a huge deficit in funding for essential infrastructure projects. “Our infrastructure is 50 percent deficient; we are in a reconstruction phase,” he said. This workload depends on well-paying jobs for skilled labor, an area Springer also worries about. Springer understands the dynamic relationship between engineering, construction and the environment. He said that at times it has been the most satisfying part of his career. “Often in my work I had to put environmental connections in the proper relationships with the projects I was working on,” said Springer, whose background in scientific research led him to, for instance, become a student of beluga whales while working as the executive director of the Knik Arm Bridge and Toll Authority in the early 2000s. Engineering with the environment in mind is not only critical to the success of a project but essential to it. his meticulous research and collection of birds, was built on the backbone of engineering. 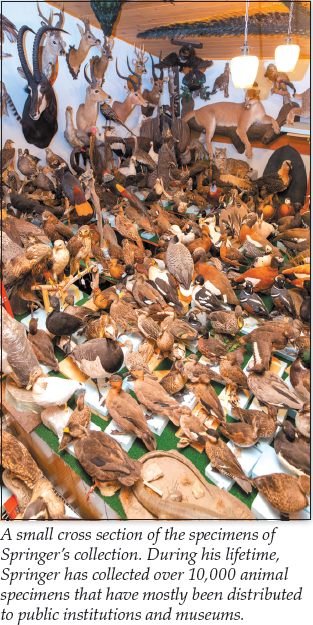 “My engineering and construction work was a way to finance my education of being an ornithologist,” he said. “I look at the ecosystem as a compound entity. Birds are only a part of that ecosystem. There is a danger to today’s scientific specialization, as you lose the connectivity you should study,” Springer said. “I’ve collected almost 10,000 specimens in my lifetime,” he said while ushering me into his taxidermy office. From floor to ceiling, shelves are stacked with specimens arranged by region and type, from birds to snakes, butterflies to sheep. The falcon collection catches my eye; one large bird of prey peers out at me. “That one is from Mongolia,” said Springer, who has been on every continent, except Antarctica, though a few penguins do appear in his collection. His museum-quality archives call to mind someone part hoarder, part genius-scientist. It is only then that it becomes clear how real this man’s life work is and how passionately he believes that these specimens are educational tools. 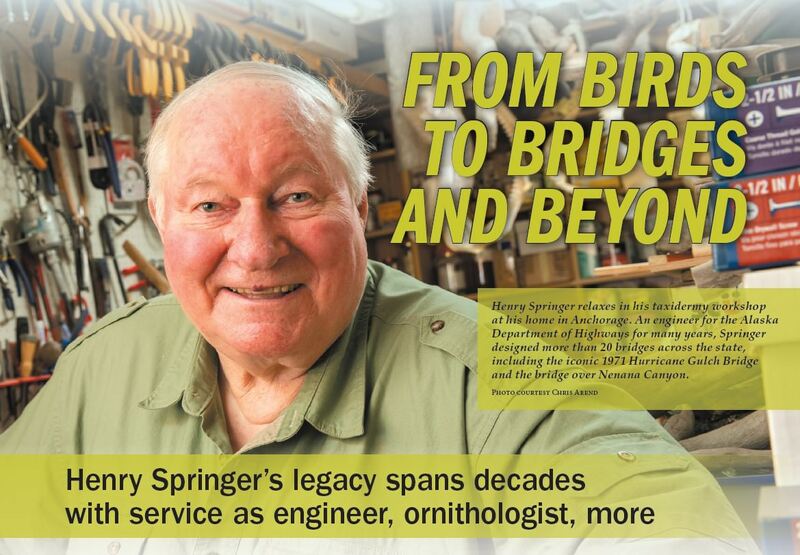 Just as future generations will benefit from Springer’s engineering endeavors, they will also enjoy the results of Springer’s ornithological passion. Springer has donated specimens to the University of Alaska Fairbanks and has submitted and published articles in respected journals. A museum in Texas is interested in purchasing his collection and has already inventoried part of that treasure. The man who has built so many bridges still has one left to cross. Having lived and fought with cancer for many years, Springer is collecting his memories on the dining room table. It holds a collection of photos of over 80 years of a life well lived, more than 50 of those in the Last Frontier. “I spent 58 years in Alaska, adopting it as my home. At no time did I want to leave. I’m proud that I’ve been involved in many great works here in the state,” he said. Margaret Adsit is a freelance writer who lives in Palmer.